This is one of those reviews that writes itself in seconds. 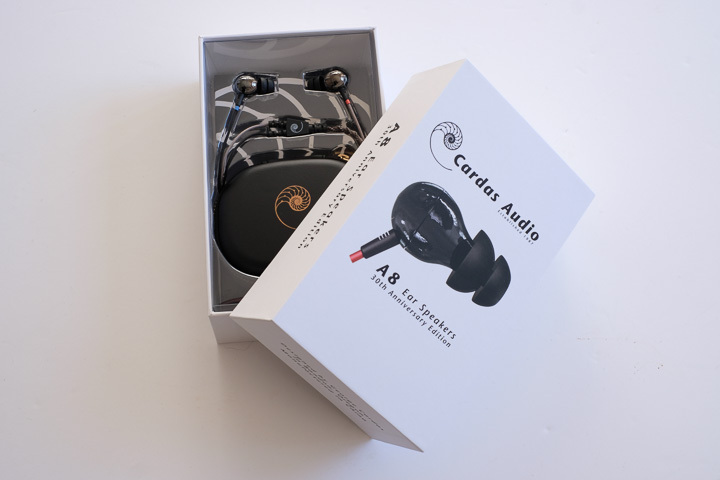 Cardas’ excellent A8 earphone (reviewed in Issue 134: http://www.hifiplus.com/articles/cardas-audio-a8-earphones/) has now morphed into the Cardas A8 30th Anniversary earphone. Practically all of the sonic glories that applied to the A8 apply to the A8 30th Anniversary edition, but there are changes. What hasn’t changed at all is the driver. It retains the single, 10.85mm full range Ultra Linear, Contour Field, Dual Magnet driver and as before uses those two magnets to reduce eddy currents. It also retains the same brass enclosure of the original A8. But where the previous model was coated in blue rubberised ABS, this new model is all shiny black chrome, with the Cardas nautilus shell outline in white relief. It looks great in the flesh, even if it is a pig to photograph! The biggest change is in the cables. Although these are still helical wound, fabric-wrapped copper cables that remain strong, flexible, and practically immune from conduction noise, there are two main differences. The trivial one is the move from bright blue to a subtler grey/black palette. The more significant change is the cable no longer terminates in a 3.5mm socket, allowing for a range of different connectors as optional extras. You can no longer ‘hot swap’ between 3.5mm TRS jacks and balanced connectors for PonoPlayers and the like. In no small part, this change is driven by demand rather than necessity; had PonoPlayer been a success, this might have been a more popular option, but instead it just left an extra break in the cable between ear and player. You can still get A8 30th Anniversary versions in balanced operation, but as a special order from the factory. The removal of one break in the cable has made the A8 30th Anniversary fractionally better sounding than its A8 predecessor. In fairness, to hear this you need to have run-in versions of both earphones side by side to compare and contrast. If you do, you’ll hear fractionally more detail and mid-band clarity to the newer version. But this is a ‘blink and you’ll miss it’ difference and if you already have a pair of A8s, the 30th Anniversary edition is not a ‘must have’ upgrade. What has changed and changed for the better is the packaging. Not just in the presentation pack with individual cards written about the operation, functionality, and running in of the earphones (written in large print to allow us with mature eyeballs a touch of vanity), but in the inclusion of a pair of Comply foam tips, as recommended in that review in issue 134. Cardas made a great earphone in the A8. It sounded tonally pure, with some surprisingly meaty deep bass, a transparent midrange, and a treble that soars. The A8 30th Anniversary edition does the same with just a smidgeon better performance (a smidgeon being equivalent to 0.5 metric tads). It was good then, and it’s just as good now. Highly recommended!